One of the trickiest things once you have your baby in a good nap routine is balancing naps and getting out. It can be even more challenging if you’ve got a toddler too. They also need to get out of the house to burn off some of that energy! 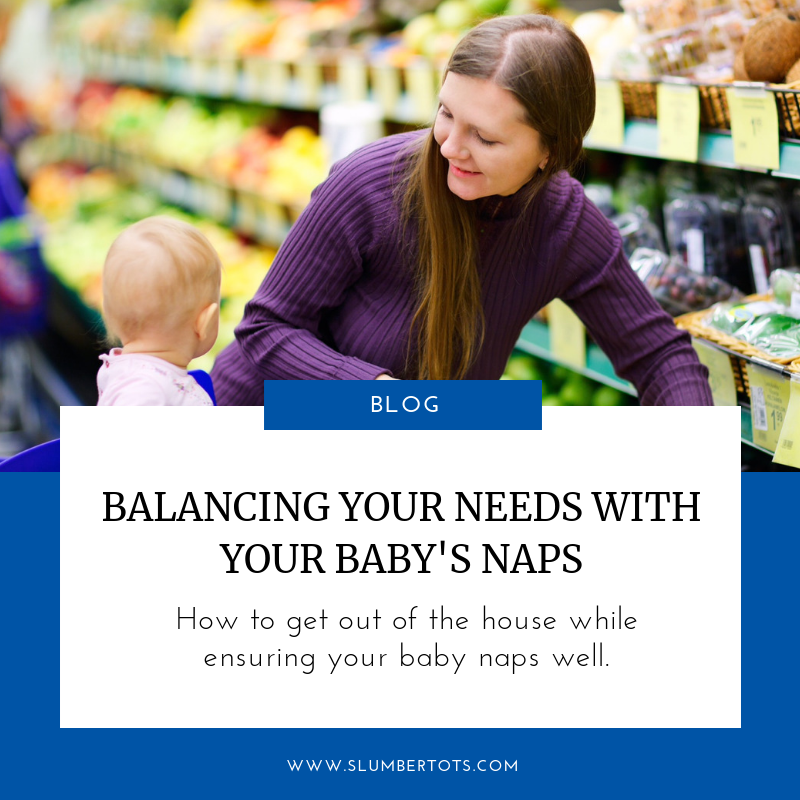 So how do you balance your baby’s naps and getting out? Whether it’s going for coffee, getting some shopping done or any of the other things that have to happen during the day, here are a few tips to help. If you’ve got a good routine in place and baby is doing well with her naps in the cot, then I suggest people follow an 80/20 rule. The majority of the time she should be napping in her cot because that’s where she’ll get the best quality sleep. We know that car seat and buggy sleep aren’t the same quality. Our bodies don’t let us go into deep sleep as often or for as long if there is motion. When you need to be out and about, motion sleep is better than nothing, but she’s going to sleep longer if she’s in her cot. I’ve always found with my own two that they’ll rarely do more than half an hour, then little things will wake them and they’re done! If you need to be out for a longer period, my recommendation is to stick with the first nap of the day at home in the cot. That’s often the best nap of the day. The last nap of the day tends to be the more problematic of all the naps. If you’ve got a child on a three nap schedule, then for the last nap of the day you can plan to be out and about. She’ll sleep in the car, buggy or sling if that’s an option. What about classes and playgroups? Something to think about when you’re looking for activities, is what time they’re taking place. It can be tricky sometimes when swimming classes or playgroups don’t fit around your child’s naps. Try to keep looking until you find something that fits. Your baby’s naps are as important as any other activities or skills that you want them to learn. Once your baby’s morning nap is over, you’re ready to go and can hopefully be back in time for the next nap. If you’re out in the car and it’s getting close to nap time, it’s quite possible that your baby will fall asleep. What do you do if that happens? Try to avoid it if you can, as car naps, even for a minute or two, will ruin the nap. Even a minute of sleep in the car will ruin the nap. If it does happen, as is inevitable every now and then, you have two options. Either you keep driving for longer and call that her nap, or get her home and try “The Transfer”. I don’t know many babies who are good at being transferred, but it’s worth a try. If you can’t do it, then wait about an hour before you try for the nap. Same thing if she falls asleep for five minutes in the car. There’s no point in going straight into nap because it’s not going to happen. Give it about an hour and then try for the nap. It can be tough trying to balance naps and getting out. I always try to keep in mind that my kids are more pleasant to be around if they’ve napped well! It might not be very spontaneous and often takes precision planning. But it makes for an easier and happier life all round! If you need some support in getting your child into a good nap routine, I can help! Please follow the link to book a call with me, or email me at katy@slumbertots.com.